It’s true y’all, I have a polyamorous heart when it comes to crafting. And my two top loves are sewing and knitting, so any project on which I can combine the two is a favorite of mine. 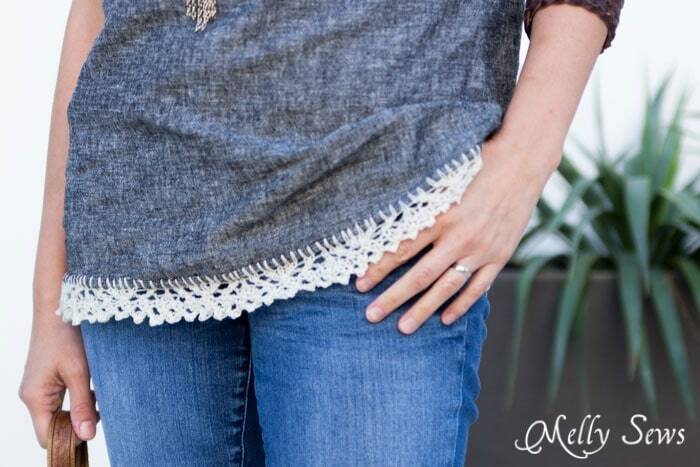 Today I’m going to show you how to knit on fabric – and how I knitted that lace edging right onto the bottom of my Blanc Tshirt. Ever since I released the Blanc Tshirt pattern, people have asked about making it entirely in woven fabric. And the answer to that question is maybe. First, I’d refer you to my Fabric Substitution Guide for why it can be tricky to substitute knit fabric for woven and vice versa. And secondly I will share the specific changes to the pattern I made to sew this one in linen. I went up 2 sizes from my measurements. When I cut out the top, I kept the width of the front and back neckline from my original size, but the rest of the top is sized up. Since I wanted a tunic length, I also didn’t do my standard 1″ vertical shortening to account for my short waist that I normally do. Which is why this top hits me lower on my body than the pattern. 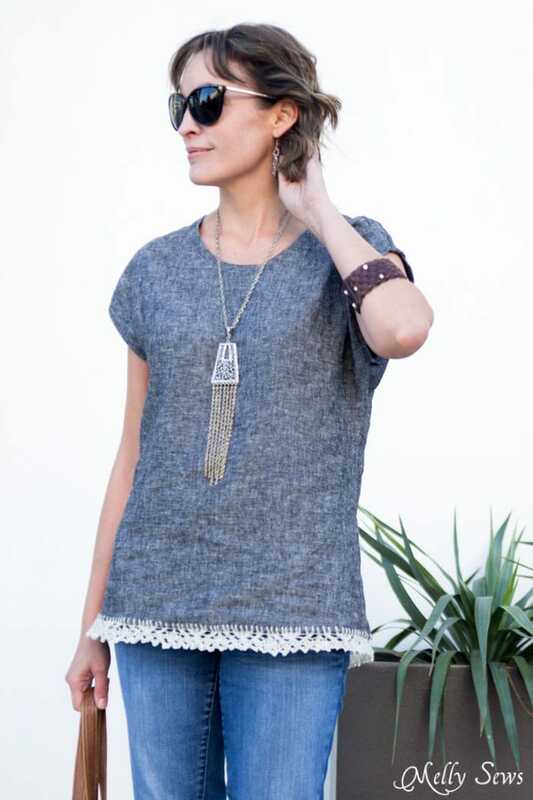 If you’re average height (5’5″-5’6″), you’d need to lengthen your top to hit you at tunic length. Thin yarn. I used lace weight merino superwash yarn. A small crochet needle. I recommend sizes B or C. I used a C.
Fabric with a looser weave. I used linen. Test your fabric before committing to it for this project by making sure you can poke your crochet needle through it. Knowledge of knitting lace; this isn’t a complicated pattern but it’s also not for a beginner. Also, it’s a good idea for me to note that a narrow hem is important and that the garment needs to be entirely finished before you start doing the edging. Ok, here’s how you do it. Poke your crochet needle through the fabric from the right side. Grab the yarn with the hook on the wrong side of the fabric and pull it through to the right side. You’ll have a loop on your needle on the right side now. Your needle may have a tendency to want to catch the threads of the fabric on the way back through, so go slowly and carefully. 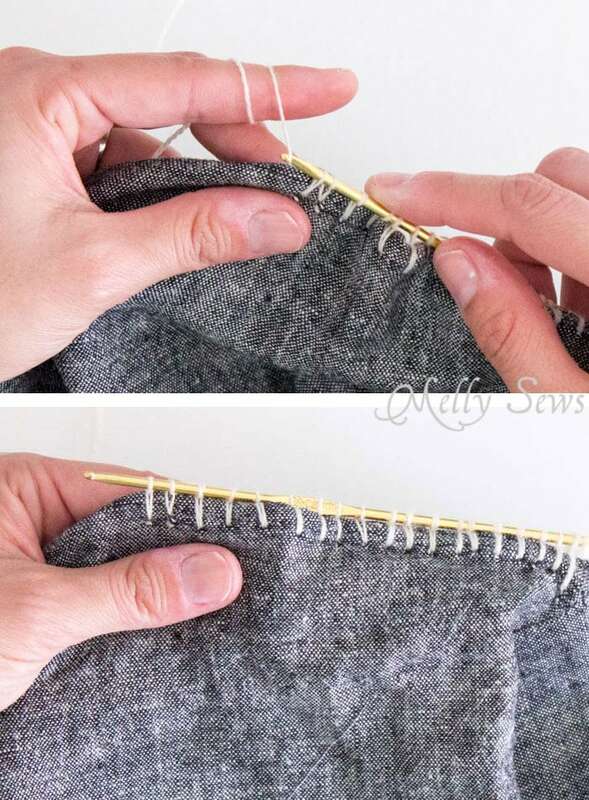 Grab the yarn on the wrong side of the fabric once again with your needle, and pull this through the loop on the front side. Make this loop a little loose on the needle, so that it will easily fit on your knitting needles when you transfer it. This leaves a loop on the needle and a loop that is flat on the front of the fabric. Repeat this about every 1/4 inches all the way around the tunic. As you get too many stitches on your crochet needle, transfer them off the end onto your circular knitting needles. 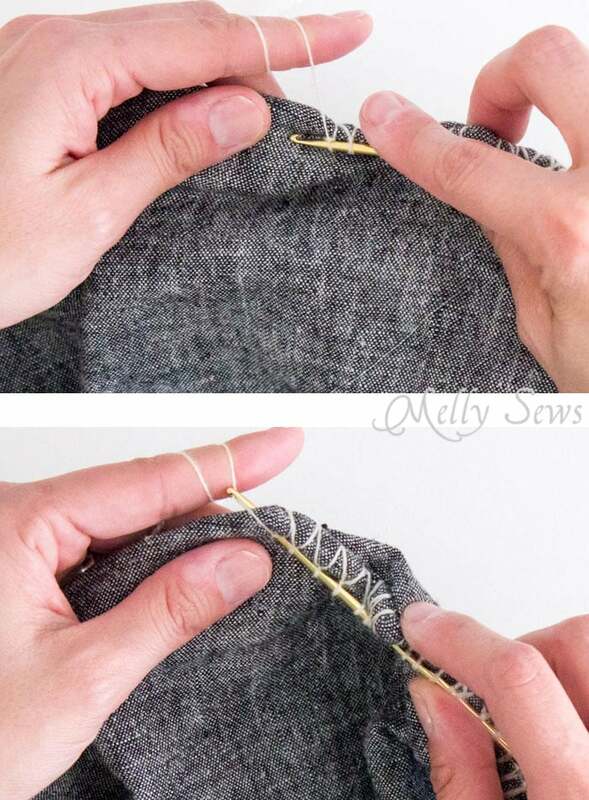 You want to end up with a total number of stitches that is a multiple of 10, so it’s a good idea to quarter your hem and measure each quarter to give you an approximate number of stitches you will get in each quarter. I did 150 stitches around mine, so I ended up with 37 in two quarters and 38 in the other two. To knit the lace, here’s the pattern, part of which is adapted from Very Shannon’s Lorelai Shawl, which I recently knit and will be sharing in my next post. For a multiple of 10 stitches in the round Place a marker at the beginning of the round and knit with the right side of the garment facing you. Rounds 1, 3, 5 &7: Knit Round 2: k1 *(yo, ssk) twice, k1, (k2tog, yo) twice, k1; rep from * to end. Round 4: k1 *k1, yo, ssk, yo, sl2kwise-k1-p2sso, yo, k2tog, k2 Round 6 & 8: Purl Picot Cast Off Poke right needle between the first two stitches on the left needle and wrap yarn as if to knit a stitch. Pull stitch to front and slide onto left needle in front of the first stitch. Repeat this between the new first two stitches on your left needle for a total of 2 stitches cast on. Bind off 4 stitches. Repeat until all stitches are cast off; your last bind off will only be 3 stitches. Weave in ends.